Pictish Holidays beyond Rhynie: a quick trip to Orkney. 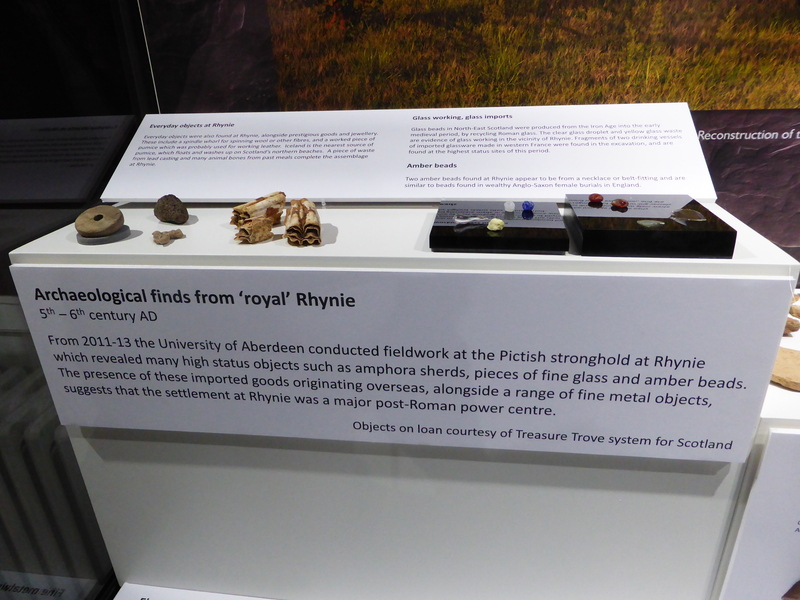 Items found in previous Rhynie digs, on show at Crafting Kingdom exhibition Aberdeen University 2015. It always amazes me that people think we didn’t travel before the 10th Century. Fair enough, we didn’t have aeroplanes and mountain bikes, but we were aware of other places and if we didn’t travel ourselves, we found out from those that travelled past us. Objects that have travelled from the mediterranean, including some vessels that may have contained wine, have been found in Rhynie. What the archaeologists haven’t managed to work out is how we got hold of them, what we traded for them or were they acquired in another way? Brough of Birsay viewed from the mainland of Orkney. A tidal island which has remains of both Pictish and Norse settlements. A piece of Antler found at Birsay. We didn’t just work in stone, we used and recycled everything even down to bones. Antlers could be polished and decorated. Part of the Pictish Symbol stone found on the Brough of Birsay, carving work very similar to the Symbol stones in Aberdeenshire. Stromness Museum, a great place to emerce yourself in all sorts of things, i particularly liked the Inuit Scrimshaw. How much is left? seen at Skara Brae. This interactive gizmo is great to show the length of time it takes materials to degrade and the percentage left after 5000 years. We’re no where near as old as that! Hopefully that means there are still more things to find of the Picts living in Scotland around 1500 years ago. What will archaeologists of the future find out about us today? Meanwhile, in Kirkwall Museum I came across a replica of the Orkney Hood. Radiocarbon-dating by the National Museums of Scotland established that the Orkney Hood dated from between AD250 – AD615. Contemporary with the Iron Age and the Picts. The piece of clothing is possibly the oldest, best-preserved sample of textiles in Britain, due to being deposited in a Bog on Orkney and found in 1867s. I am seen wearing a tunic on the stone, I may have had brooches and pins as well as casts of these have been found on other pictish sites. In the long dark nights on Orkney we had time to play games like these ones. Sketched intersected lines on slate and stone and pieces made out of bone. Do you know how to play the game? What better way to finish trip to Orkney than watching the sun go down at the Ring of Brodgar. Although these stones were there well before the picts, they were still beautiful and remind me of people standing in the landscape. What do you think was the quickest way to get around in Pictish times? How about on foot, horse, boat? How long would it take you to get to Orkney, with no cars, helicopters or ferries? Us Picts were brave and hardy souls, the journey to Orkney reminded me, just how brave we were, if only I could remember the natural remedy we used for sea sickness!? Next time I visit Orkney, I’ll need to head even further north and visit Shetland to catch up with my Pictish cousin, Mail. However, I think I need to wait until I’ve got my sea legs back.